Murals painted across Western Avenue are adding more colors to Koreatown. As a part of Great Streets Initiative launched by Mayor Eric Garcetti, Western Avenue in Koreatown is increasingly covered with artistic murals. Mayor Eric Garcetti launched the Great Streets Initiative in 2014 to help re-imagine neighborhood centers, with an aim to make streets more livable, accessible, and engaging public spaces for people. With its goals being the city’s increased economic activity, improved access and mobility, and greater community engagement, Great Streets is turning streets across Los Angeles into more active public spaces with enhanced local culture. Western Avenue, located at the northern end of Koreatown and the southern end of East Hollywood, serves as the backbone of Koreatown. So far, Great Streets has improved Western by upgrading bus shelters with USB charging station and wifi, installing solar powered bench, and completing 17 continental crosswalk improvements from Melrose Ave to 3rd St. 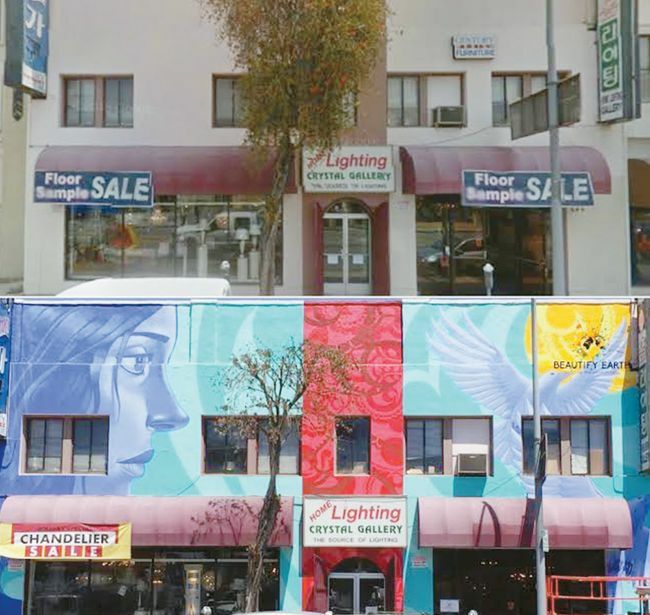 Among various investments including listed above, what has been visibly added to the street is five wall murals, including those on Bun shop and Home Lighting Crystal Gallery. In partnership with Councilmember David Ryu and Beautify Earth, Great Streets has beautified facades on Western, improving the vibrancy of the street. With four more wall murals to be painted, residents in and visitors to Los Angeles Koreatown are expecting the community to become more animated than ever.